While it's true the fashion industry has an (often well-deserved) reputation for taking itself a bit too seriously, one major design house proved it knows how to have fun at its show today in Paris with a genius promotion for the long-awaited Zoolander 2. Valentino's fall 2015 runway presentation was, at least for the first 15 minutes or so, a beautiful but not exactly earth-shattering collection of dark lace dresses and intricately embroidered silks. Just as it seemed the show was ending, things took a sharp turn. Instead of the usual line of models coming out for the finale, two gods of fashion appeared. 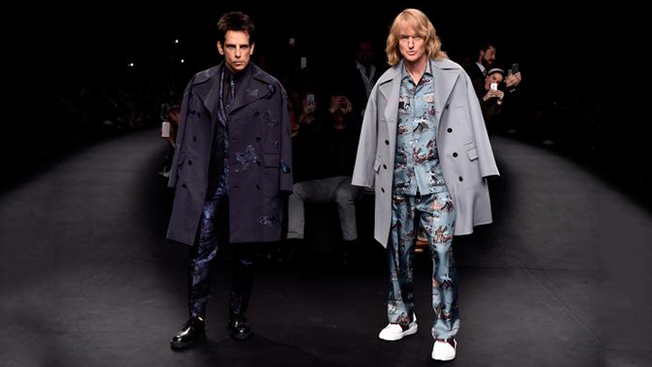 Yes, Derek Zoolander and onetime arch nemesis Hansel McDonald (also known as Ben Stiller and Owen Wilson) came out of retirement to walk the runway for Valentino—and, more importantly, seal the deal for Zoolander 2. Rumors of a sequel to the 2001 film have been percolating for years. In December, Wilson told Ellen DeGeneres, "I don't mean to be coy, but I know that there's a script, and Ben [Stiller] is considering it." And last month, reports surfaced that the movie would begin filming in Rome this summer. Today's stunt was the first official announcement for Zoolander 2, with Paramount confirming via Twitter the movie will be released Feb. 12, 2016. While plenty of other designers certainly created buzz with celebrity-filled front rows and over-the-top presentations, there's no question Valentino will be the show everyone talks about.